This 200-hour yoga teacher training course includes meditation, mantra chanting, shatkriya, Hatha yoga, Ashtanga Vinyasa yoga, anatomy, yoga philosophy, Ayurveda, and group discussion classes, together with the practice of various different level of asanas with their benefits. During your stay with Rishikesh Yogkulam, you will experience a life-changing opportunity which will give you one the most memorable moments in your life. This holy journey will lead your path towards enlightenment and becoming a great teacher. During the course, you will be staying at Rishikesh Yogkulam in Hotel Laxmi Palace. The school has two yoga studios, dining area, and lift facility. Rishikesh Yogkulam offers single and double room based on the student’s requirements. Every room has attached bathroom with western toilet and hot shower and balcony with a mountain view. The rooms for the yogis are well maintained and clean. They offer bed sheets, pillows, bath towels, toilet paper, a blanket, and welcome amenities upon arrival. Good Wi-Fi is included on every floor. Water and laundry service is also available. Upon completion of the 200 hours yoga teacher training course, students will be awarded a Yoga Alliance USA certificate. Registration with Yoga Alliance provides a globally recognized credential. This 200-hour yoga teacher training course includes meditation, mantra chanting, shatkriya, Hatha yoga, Ashtanga Vinyasa yoga, anatomy, yoga philosophy, Ayurveda, and group discussion classes, together with the practice of various different level of asanas with their benefits. During your stay with Rishikesh Yogkulam, you will experience a life-changing opportunity which will give you one the most memorable moment in your life and this holy journey will lead your path towards to enlightenment and becoming a great teacher. During the opening (welcoming) ceremony, you will be provided with a complete yoga kit which includes a yoga mat, books for study, notebook, water bottle, neti-pot, rubber neti, school t-shirt, and rudraksha mala. 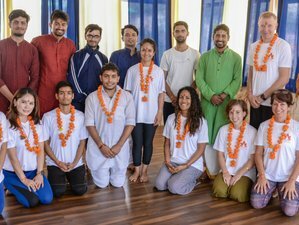 Rishikesh Yogkulam has made their 200-hour yoga teacher training course in such a unique way so it suitable for all the different level of students as it includes yoga for beginners, primary series, intermediate series, and advanced level. Every single student in the class will get the personal attention from the individual teachers as all the yoga gurus are highly qualified, experienced holders, and well-known names in India. This 200 hours yoga teacher training course is for those who would like to deepen their practice, for new learners and for beginners. This program is registered with Yoga Alliance USA. It is for those who would like to deepen their knowledge and practice in different aspects of yoga, anatomy, Ayurvedic therapies, and yogic life. During the course, you will assimilate not only the main subject of yoga but also learn the principles of yogic philosophy which will put you on the right path. You will expand in the world of yoga, develop spiritually and physically, and improve your knowledge, professional skills, and the ability to teach yoga in your specific way. You will have special classes to understand the nuances of class teachings based on yogic principles and discussions on philosophical topics that will help streamline the approach and experiences of yogic practices in the class. The dedicated and experienced panel of yoga teachers and gurus, at Rishikesh Yogkulam, have immense knowledge of Vinyasa yoga flows, Vinyasa yoga poses, different kinds of yoga, Ashtanga yoga, Hatha yoga, meditation, and much more, following a unique way of making seekers learn, providing full attention on the needs of people personally as well as professionally. The staff is highly cooperative and ensures to make your stay as convenient as possible. Students will take turns practising their teaching skills by performing in front of their peers and teachers. Yogacharya Dhirendra Bisht is one of the co-founders of Rishikesh Yogkulam and is a master of teaching yoga teachers courses, retreats, and allied techniques. Dhirendra was born in the lap of Mother Ganga and grown up in the shadows of Bhoothnath Shiva Temple amidst the forests of Himalayas. Dhirendra has spent many years in the field of yoga. He has been teaching a large group of students from around the globe, helping them on their journey to become learned and compassionate humans through the holistic study of yoga science. Born and brought up in Rishikesh, popularly known as the world capital of yoga. Amit is a young yoga practitioner and a learned yoga guru. His first formal training was at Jay Ram Ashram, Rishikesh, where he did an in-depth study on subjects like Hatha yoga, yoga philosophy, anatomy and physiology, yoga therapy, shathkarma, yogic diet, and nutrition, along with other aspects of art. Since then, Amit has dedicated himself to the path of yoga to gain proficiency in his work. Anant Jethuri is a young and dynamic teacher who is always curious about all these spiritual aspects of yoga and their connection with human anatomy. He always wants to help people to be healthy and always motivate them for healthy, wealthy lifestyle by the knowledge which he got on the university about health, anatomy, and physiology. He has done masters in biology and taught it for different schools in Rishikesh. Mandeep Ji is one of the popular yogis in Rishikesh. with his 10 years of yoga practice and teaching mantra chanting, yoga philosophy, and meditation, he has become an expert trainer of yoga. He has also worked as an astrologer for nine years. Mandeep Ji’s heart and soul lies in music and he says that music is life for him. He has practiced yoga and spirituality in Rishikesh for 18 years. Mandeep Ji is a yoga guru who has given a valuable part of his life to yoga and the preaching of meditation, sound healing, and the practice of yoga philosophy. Surendra has been instrumental in the yogic path since 2000. Professionally trained as an electrical engineer, he worked with India’s top Engineering Institute (IIT Roorkee) and Multinational Companies before fully dedicating himself to the cause of yoga. He has been trained extensively in yogic science from various world-renowned yoga institutes and holds a Post Graduate Diploma in Yoga Education (PGDYed) from Kaivalyadhama Yoga Institute, Lonavala, and a Master of Science (MSc) degree in Yogic Science and Holistic Health. He is a qualified yoga teacher under AYUSH. Yogacharya Yashpal Kaintura has two years of experience in yoga, psychology, and management at the Dev Sanskriti University, Haridwar. He is authorized by Dev Sanskriti University to teach and heal society. He is known for his authenticity and non-judgmental teaching styles with compassion centered yoga. Yogacharya Yashpal Kaintura has three years of experience in teaching and conducting workshops, seminars, and retreats. His main objective is to provide results with different yoga practices integration to alternative therapies like Marma therapy and naturopathy. The school is situated in the heart of Rishikesh, next to the famous hanging bridge and the holy Ganga (the holy river). The school is peaceful and surrounded by beautiful green mountains. Everything is close by the school such as shops, cafes, restaurants, ATM, healthcare, organic stores. Daily freshly made vegetarian meals are included in the price. The food is fully prepared hygienically and the vegetables are organic. Rishikesh Yogkulam food is well known all around the world for its taste and verities. When diet is wrong medicine is of no use. When diet is correct medicine is of no need - Ayurvedic proverb. Many poeple wonder if it is enough just to practice yoga. In itself, practicing yoga is not just a healthy life but at Rishikesh Yogkulam, they believe that it is also a way of living. But when complemented with the healthy food habits, it can really create wonders. In fact, eating the right food is an essential part of living a yogic life. What you eat not only influences your physical well being but also your emotions and thoughts. Yoga does not dissect food into proteins, carbohydrates or fats, instead, it classifies them according to the effect they have on the body and mind, into three types - Satva, Rajas, and Tamas. Tamasic food is the kind of food which makes you lethargic or sluggish, while Rajasic food is that which brings about activity or restlessness. Whereas, Sattvic food is the kind which makes you feel light, energetic, and enthusiastic. Sattvic foods are those which purify the body and calm the mind. They stimulate the body and mind into action. Cooked food that is consumed within 3 - 4 hours can be considered Sattvic. Menus at the center are created by their master chef Sandeep Semwal who had worked with some of the best five-star hotels around the world and carries great knowledge about Sattvic diet. Along with this, he focuses on hygiene practices at the institution to ensure the food is safe and carries great nutritional values which is much needed for a healthy life. Not just the right kind of food is important, it is vital to eat the proper quantity of food at the right time. Overindulging leads to lethargy while under eating will not provide enough nourishment. Most of the times you know that your stomach is full but tempted by the taste buds, you tend to indulge. The right amount of food cannot be quantified into cups or grams. When you listen to your body attentively, you will know when exactly to stop! You might eat the right kind of food in the right quantity but if you are irregular with your timings, then the whole system goes for a toss and the natural rhythm of the body is hampered. Therefore, it is of prime importance to eat food at the same time every day and eat it at regular intervals. It is said that the state of the mind of the person cooking / eating also affects the food. The energy in the food cooked by someone while he / she was angry will definitely be lower than that of someone who cooked it with a feeling of love, contentment, and gratitude. Listening to some soothing music or chanting while cooking and eating can help retain the prana (life force energy) in the food. It is definitely worthwhile to pay some attention to the food that you eat as the ancient Indian texts say that you are what you eat! Below are some of the amazing things to do in Rishikesh. These activities are not included in the package but Rishikesh Yoga Teacher Training Center can arrange upon request. Please book your flight to arrive at Indira Gandhi International Airport (DEL), from where you can take a domestic flight to Dehradun Airport (DED). Upon your arrival, there is a complimentary taxi waiting for you, which will bring you from the airport to the yoga school at Laxman Jhula. From Indira Gandhi International Airport (DEL), you can get a taxi to bring you to Delhi ISBT bus station. From there, you can find many government and private means of transportation to bring you to Rishikesh. Once you arrive at Rishikesh bus station, your complimentary pick up will be waiting for you to bring you to the yoga school at Laxman Jhula. The nearest railway station is Haridwar train station. From there you will find many buses, taxis, and other transportation services that will bring you to Rishikesh. If you want Rishikesh Yoga Teacher Training Center to help you arrange transportation from Haridwar, kindly let them know. Rishikesh Yogkulam is a Rishikesh, India, based yoga training center, offering traditional and professional yoga teachers course.